One common roadside breakdown is the sudden loss of fuel or very poor running. It helps if you understand the fuel system and how to maintain it; regularly cleaning the sediment which gathers in the bottom of the carburettor bowl and also in the base of the fuel pump. 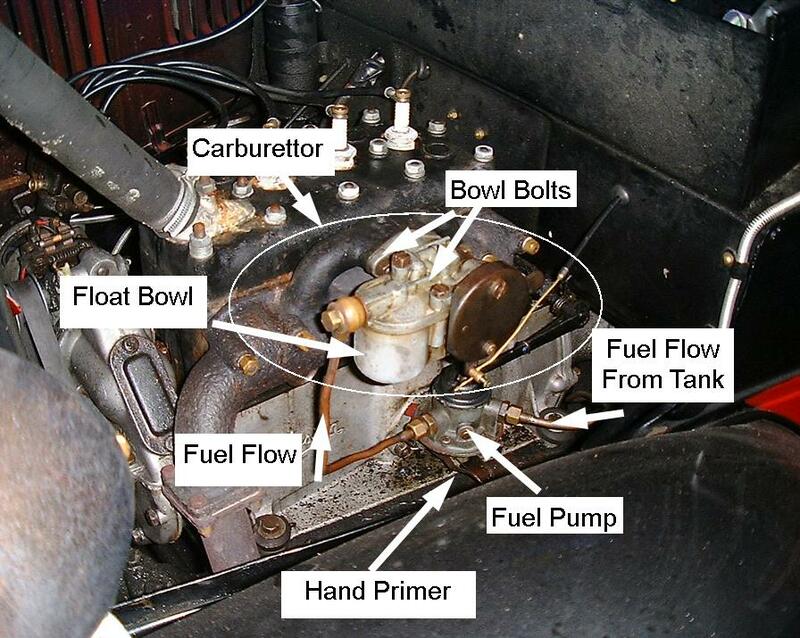 In the early Sevens up to 1931 the fuel flows from the scuttle tank directly to the carburettor float bowl due to gravity. The later Sevens have a rear mounted fuel tank and the fuel is drawn from the tank by the fuel pump, passing through the pump, and up to the carburettor. 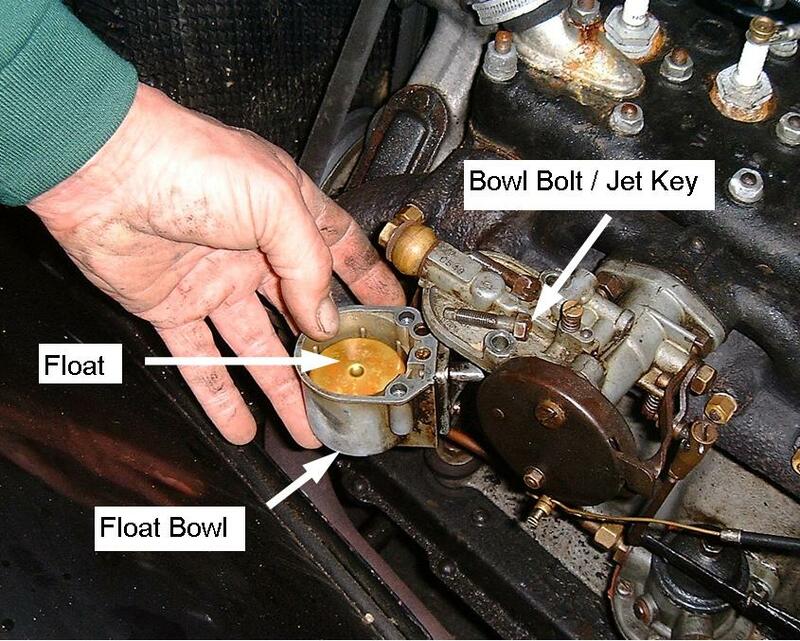 It passes through a valve in the top of the carburettor and into the float bowl. The fuel is drawn, through jets in the bottom of the float bowl, into the engine cylinders where it is ignited by the spark from the plugs. The hand primer is used to pump fuel to the carburettor when the engine is not running. (For checking or priming purposes). The bowl bolts are unscrewed to enable the float bowl to be removed. The float bowl acts as a “fuel reservoir” and, therefore, should always contain fuel when removed. The float controls the level of the fuel in the float bowl and “floats” in the fuel. The dimple in the top of the float bears on the valve in the top of the carburettor and closes it when the fuel reaches the correct level. As the fuel in the bowl is used the float drops, allowing the valve to open and let more fuel in …..and so on! The bowl bolts hold the Float bowl in place and are unscrewed to release it. NB The end of one of the bolts has a square formed on it and acts as a jet key to remove the two jets in the bottom of the float bowl. 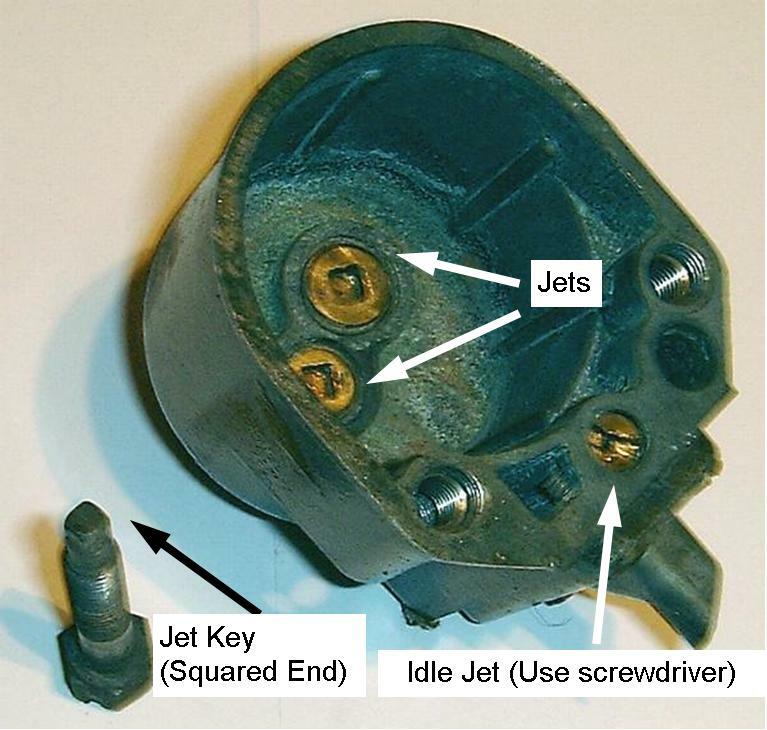 To remove the jets locate the squared end of the jet key in the square hole in the top of the jet. Using a suitable size spanner on the head of the jet key unscrew the jet in an anti– clockwise direction. It should be possible to see through the fine hole in the jet if it is held up to the light. If not blow through it to clear the blockage. NB Do not be tempted to poke a pin or similar into the hole to clear it, damage may result. The small idle jet in the top of the float bowl is unscrewed using a small screwdriver and cleaned in a similar way. Don’t forget to replace the float correctly, with the dimple upwards, in the bowl when refitting! Finally use the hand primer to fill the float bowl before attempting to start the engine. Fuel starvation - cause of breakdown as a check through the solving the problem.